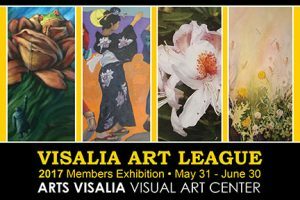 For the month of June, Arts Visalia is pleased to present the annual Visalia Art League membership exhibition entitled, “Creatures Big and Small.” On display will be art pieces by a number of Art League artists, in a variety of media, including oil and acrylic painting, watercolor, photography, drawing, and sculpture. Awards will be distributed during the reception, including Best of Show and People’s Choice awards. This show runs from June 1 through June 30. The opening of the show will be held on Friday June 2, from 6:00 p.m. to 8:00 p.m. The Visalia Art League is an organization dedicated to supporting and promoting the arts and introducing artistic trends to our community. Its mission is to encourage and support the production, cultivation and exhibition of art. Events include monthly artist presentations and demonstrations, annual membership shows, museum trips, workshops and student scholarships. Through unique programs, the Visalia Art League provides opportunities for everyone to experience, create and enjoy art. To carry out the league’s mission, the members focus on educational programs to inspire artistic and professional development for all artists and individuals who aspire to become artists. © 2017 Arts Visalia - Web Design By D.S.